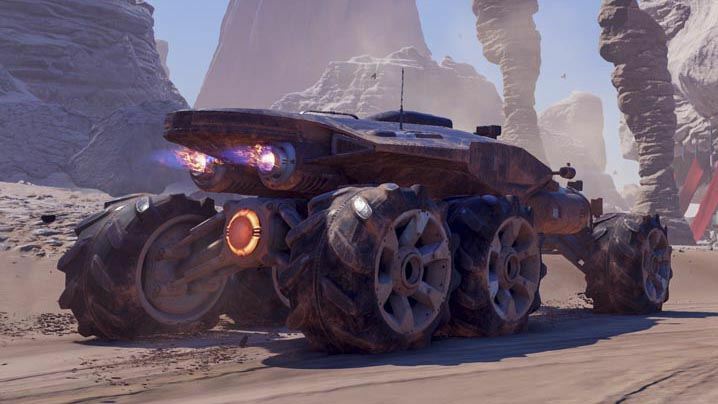 Nomad is the land based vehicle in Mass Effect Andromeda that you will use to explore Locations. It is a 6 wheel drive all purpose vehicle that will be your mobile ally when setting up outposts and engaging in open combat. The Nomad is the game’s exploration vehicle. Planet exploration involves combat encounters, puzzles and stories to discover. Some will have bosses you will have to return to later to defeat. The Nomad does not have its own Weapons systems. It features a rear boost for an extra bit of planet scouting speed. It can assist in helping you mine for resources and set up forward stations on planets. The Nomad also allows you to scan surfaces and mine them for Minerals. The game's dynamic cover system allows you to use the Nomad for cover in Combat. The Nomad's life support systems can protect you from hazards longer than your combat armor but not for an unlimited time. The Nomad will begin to take damage once life support is depleted. It is stored in the Tempest when not in use, and deploys when you land on a planet. It does not have guns on it, but its controls are an improvement over the Mako. You can call the Nomad down from activated outposts that you set up on colonies. You can research and develop upgrades to the Nomad in Crafting. Thrusters, shield, shield blast, life support, radar and paint jobs can all be customized how you see fit, depending on the conditions of the planet you’re exploring. Advanced Detection Systems Allows the occupants of the Nomad to detect enemies through obstacles at a range of up to 75 meters. Advanced Life Support Installs power cells that can briefly generate a mass effect field around the Nomad to shield occupants as they are exiting the vehicle. Agility Mode Allows the Nomad's Stability Assist, which is always on by default, to be disabled, giving an expert driver greater control over the vehicle. With Stability Assist disabled, the Nomad is more agile, but will have less traction wen cornering. Defensive Fortification Improves the Nomad's shield strength and frame integrity by 25%. Emergency Shield Discharge When the Nomad's shields are entirely depleted, shield cells will discharge, generating a shockwave that sends nearby enemies flying. Improved Boost Expands booster chambers to provide a longer boost in both drive modes. Improved Shield Regeneration Upgrades the Nomad's shield cells, allowing for faster regeneration without sacrificing effectiveness. Improved Suspension (4WD) Increase the Nomad's top speed in 4WD mode. Shield Reset Bonus Upgrades shields tto reduce the time it takes for shields to begin regenerating. Supercharged Boost Greatly improved air flow and fuel injection allows for an even longer boost time. Supplemental Life Support Upgrades the Nomad's life support system to improve functioning in extremem environments. Torque Management (6WD) Improves torque in 6WD, allowing for a faster top speed in that mode.